An EQ like no other? A sweetening EQ like no other, RZ062 has a quasi-magical frequency-refining effect on vocals, drums, basses, mixes and more. Two middle control modes work well. Presence knob is a bit bonkers. 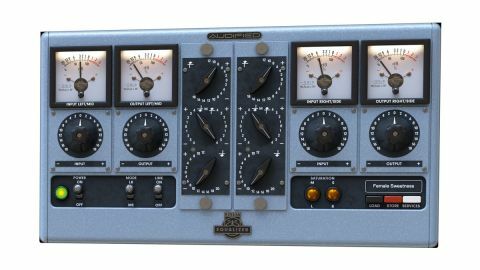 This two-plugin (VST/AU/AAX) bundle from Czech developer Audified emulates the extremely rare (and absurdly expensive) Siemens Klangfilm RZ062A and RZ062B valve console EQs from the 60s. Originally designed for use in post production, the modules found favour with music producers primarily for their effect on vocals, the difference between the two being the process governed by the middle one of the three controls - see A/B comparison. The hardware was a simple three-knob device, and Audified’s virtual take on it models over 200 internal circuit components to capture the saturation and other sonic qualities, before adding mid/side routing and metering. The first thing to understand with RZ062 is that it takes a rather different approach to other EQs, particularly with regard to the middle control. The general layout is straightforward enough, though, with separate Input gain, Output gain and EQ controls for the Left/Mid and Right/Side channels (the Mode switch toggles between the two configurations) adjusted together in Link mode or independently. Up to 18dB of input overdrive is on tap, and the distortion gets good and edgy towards the top of the scale. The two Saturation bulbs glow increasingly intensely as the signal heats up, and Input and Output meters let you keep an eye on the levels. There’s also a handy slider accessed from the Services menu for calibrating the input, with your chosen setting (from -24 to 0dBFS) saved either for the current instance of the plugin only, or as the default for all instances. The EQ itself is a three-band affair, and the top (Treble) and bottom (Bass) bands are identical across the two modules. Both are essentially variable shelving EQs, with the knobs increasing the steepness and shape of an upward or downward response slope that ranges from 1kHz to 10kHz for the Treble, and 40Hz to 1kHz for the Bass. Treble offers up to 12dB of boost or 18dB of cut (at 10kHz), and Bass delivers +12/-20dB (at 40Hz). Treat them like very gentle shelves, between them covering pretty much the full audible spectrum, and you won’t go far wrong. The middle EQ control, meanwhile, is described in A/B comparison. RZ062 Equalizer is a decidedly non-surgical solution intended for mastering work, and ‘broad strokes’ polishing and enhancement of instruments and busses - one of those ‘musical’ EQs that rewards setting by ear rather than thinking too much about frequencies and gain amounts. The only difference between RZ062A and RZ062B is the function of the middle EQ knob, which offers two very distinct styles of frequency shaping. In RZ062A, it’s called the Mid control, and it tilts the whole frequency curve on a pivotal axis at 650Hz by up to 4dB. Ie, turning the knob (which only rotates through half its range) full clockwise applies a 4dB boost at 100Hz and a 4dB cut at 10kHz, with the frequency response curve joining the two, meeting the 0dB line at 650Hz, it’s good for instant darkening or brightening. In RZ062B, the middle knob is the Presence control, sweeping continuously through four fixed centre frequencies - one for each quarter of its travel - in 0.8dB boost increments, up to 4.8dB. This combination of frequency and gain in a single knob isn’t at all intuitive, but for dialling in a smooth, well-tuned boost at 1.4, 2, 2.8 or 4kHz, the end result is worth the weirdness. As its suggested vocal leanings imply, it really excels at bringing out the mids and highs without adding harshness, but it’s pretty effective at enriching the low end, too, especially when its gorgeous tube saturation is brought to bear. The A/B Mid/Presence knob variations each have their own uses, while the Mid/Side mode extends the plugins’ mix-tweaking credentials beyond the hardware they imitate. Obviously, we don’t have a real RZ062 lying around for comparison, so we can’t comment on the accuracy of Audified’s version in that sense. What matters, though, is that it sounds stunning in its own right - a high-class sweetening and aerating EQ with real analogue mojo.